Chairman of the Sri Lanka Podujana Peramuna (SLPP) Professor G.L. 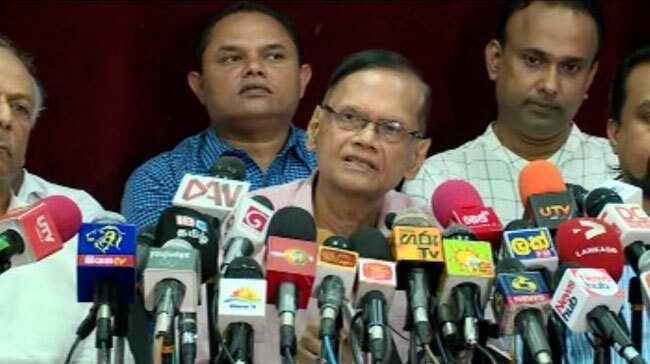 Peiris says a legal problem does not exist with regard to the new government established in the country and that a fictional issue has been “deliberately constructed” to mislead the public. He stated that there has been a great deal of discussion during the last 12 to 14 hours about the legality of the new government that has been established in this country. “Now there is no legal issue at all. This is an artificial creation which has no basis or foundation whatsoever,” he said, speaking at a Joint Opposition press briefing in Colombo today (27). The former foreign minister said that the main consideration here is the period during which the Prime Minister can lawfully hold that office. The former minister also explained as to what transpired yesterday and how the Cabinet of Ministers ceased to function last evening. “It did cease to function and when it ceased to function, with the Cabinet went the Prime Minister. That is a very simple sequence of events,” he emphasized. He said that the way the Cabinet ceased to exist has to do with section 46 (1) of the 19th Amendment, which for the first time in this country lays down a compulsory maximum for the number of ministers who constitute the cabinet of ministers. He said that in terms of Section 46 (1), the total number of Cabinet Ministers now permissible under the law is 30 and then when the deputy ministers and state ministers are added, the grand total cannot exceed 70. “That is a compulsory legal requirement. There is however an exception to that principle, a provisory which is contained in section 46 (4).” The affect of 45 (4) is that when the largest party in parliament enters into an alliance to govern the country together with other parties. Then in that special situation the maximum does not apply, he pointed out. Professor Peiris said that yesterday an event of great legal significance occurred. That was the General Secretary of the UPFA Mahinda Amaraweera addressed a letter to the Speaker with a copy to the President Maithripala Sirisena declaring that as of last evening the UPFA is moving out of the unity government. He states that the UNP and UPFA came together by means of a MoU, in terms of that which this coalition government was formed. Now one of the priorities is detaching itself from that coalition government, he said, adding that it was conveyed formally in writing by the proper authority, namely the General Secretary of the UPFA to the Speaker of Parliament. “Now that cabinet no longer existed. When that cabinet when out of office, together with it went the Prime Minister. So you have to start on a clean slate,” he said. Then the president has the authority to select the person who in his opinion commands the confidence of the majority of members of parliament, the SLPP chairman stressed. He said that finally the Parliament meets again on 16th of November and on that day it will become “abundantly clear” that Mahinda Rajapaksa commands the confidence of an overwhelming majority of the members of the Sri Lankan Parliament. “Why the 16th of November? Because we have to go for a Vote on Account.” He stated that the earlier expectation was that a budget would be presented on November 5, but now they are going for a ‘Vote on Account’ which enables the state to obtain the resources that are required to govern the country for a period of three months. He stated that a Vote on Account has to be systematically prepared and it can’t be done in 3 or 4 days. Therefore a reasonable period is required to prepare and that it will be readied by 16th of November, he said. “Apart from that, as a result of what happened yesterday not only ministers but secretaries to ministries also go out of office.” Therefore secretaries have to be appointed afresh in order to ensure the continuity of the government, he said. Apart from that other housekeeping arraignments, the seating arraignments in parliament will have to be attended to and that also will take a few days, Professor Peiris said. “Therefore a legal problem does not exist. This is a fiction that has been deliberately constructed to mislead the public both here and aboard,” he charged.